Hitachi Construction Machinery (China) partnered with the Eco Association of Hefei University to support a clothing drive for the Hengshan Charity Foundation in Wuxi City from April to May. This campaign targeting university students and residents of nearby apartment blocks aimed to exchange old clothing for reusable shopping bags and umbrellas to promote a low-carbon society and resource efficient society. Hitachi Construction Machinery (China) announced the event well in advance so that many of its employees would take part. The clothing drive was held on May 5th at the company’s employee dormitory and at the company on May 7th and 8th. 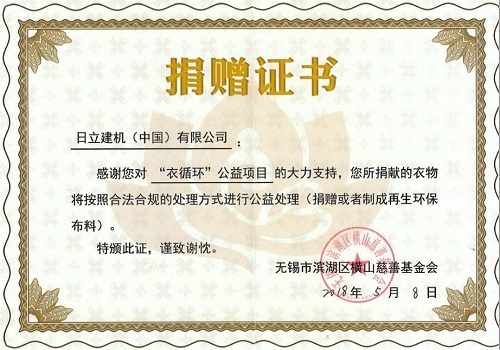 The clothing that was collected was donated to the Hengshan Charity Foundation of Wuxi City after being forwarded by a logistics company. After receiving the old clothing, the foundation separates out relatively newer clothing and donates it to less fortunate communities. Old clothing that is not eligible for donation but recyclable is used to make eco-friendly products such as recycled fabric and mops. 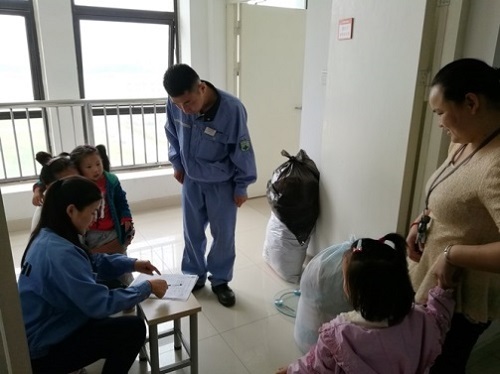 Through this campaign, a total of around 600kg of old clothing was collected by Hefei University, residents of nearby apartment blocks, and Hitachi Construction Machinery (China). According to data of the Bureau of International Recycling (BIR), the clothing collected from this drive helped to conserve about 3,570 tons of industrial water, curtail some 2.14 tons of CO2 emissions, and reduce fertilizer and pesticide use by 0.18 tons and 0.12 tons, respectively.